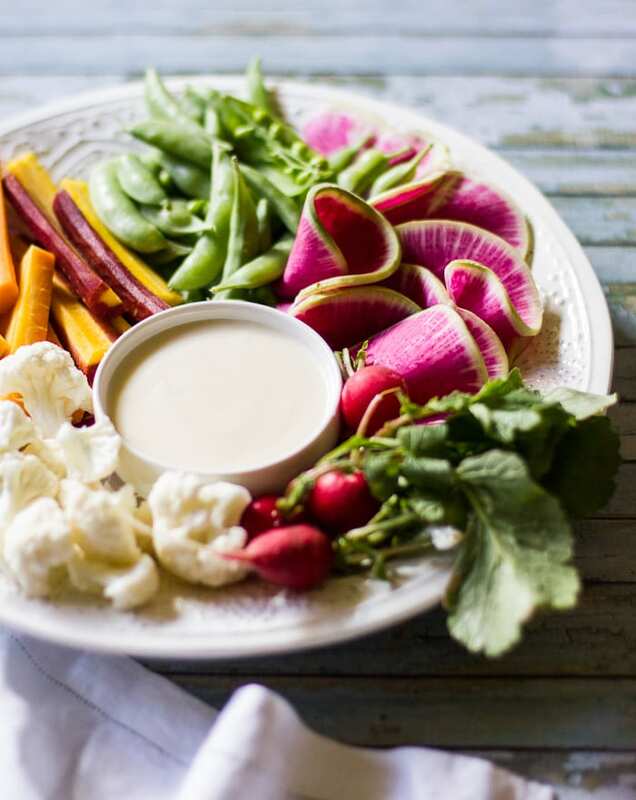 There’s a reason why people bypass the crudité platter at parties. The list goes on, but I’m sure you get the point. Fact of the matter is, the typical crudité platter seems like a chore. It’s obligatory. It’s the classic hors d’oeuvre that must make an appearance at every event. But all it takes is a few simple swaps to transform predictable, into the ultimate party appetizer. Instead of baby carrots, or even regular orange carrots, look for rainbow colored ones. It’s a feast for the eyes! They’re in season late fall to early winter. I found mine at Trader Joe’s (shocking, I know). Swap out broccoli for crunchy, sugar snap peas. They’re sweet and nutty when eaten raw. I like to open up a few of the pods and sprinkle the peas around the plate. See those pretty pink slices? Those are watermelon radishes. They’re wonderfully crunchy and less peppery than regular radishes. Speaking of radishes, keep their leafy green tops attached. They’re perfectly edible. If they look all hungover and wilted, just pluck them off. No big deal. Yes, there’s raw cauliflower on that plate. And no, I’m not a hypocrite. The only way to get me to eat raw cauliflower is with creamy white miso dip. This stuff is legit. To make the dip, I blend miso paste with yogurt, honey, rice wine vinegar and garlic (but only 1/4 clove). And it’s like no other crudité dip you’ve ever tasted. Sweet, salty, and very addicting. To keep it interesting, cut the vegetables into different shapes and sizes. I love thin slices of watermelon radish, tiny peas, and bulky cauliflower all on one plate. Arrange everything nicely with your creamy white miso dip in the center. The dip can be made 1 day in advance. Keep covered and chilled until ready to use. Makes 1 scant cup. I’ve tried prepping the vegetables ahead of time, and although they looked okay, they’re more vibrant and fresh when sliced fresh. If you can’t find watermelon radishes, use thinly sliced regular radishes, leaving some whole with their leafy tops attached. White miso paste is easily available in most grocery stores. This recipe can be scaled up or down. I don’t use exact measurements for the vegetables (go with what you need). Add all of the dip ingredients to a bowl, starting out with 1 tablespoon of the honey. Whisk throughly to combine. Taste, and add the remaining tablespoon of honey if you'd like it sweeter. The flavor should be salty, tangy, and slightly sweet. Arrange the vegetables onto a serving platter. Open up a few of the sugar snap pods and sprinkle the peas around the plate. Serve with the dip on the side. I love the use of miso in the dip. I’ve never thought of that but it’s such a fantastic idea to spruce up the vegetables! Hello Nicola! It’s so tasty! We hosted halloween at our house this year, and I served a version of this- everyone loved it. Emilie!! You did it AGAIN! Looks lovely and appetizing. And that miso dressing sounds so SO good. So pretty and perfect for entertaining. Love the miso dip! Wow what a stunner!! I just need to hire you to make it look this good!! WIll have to try the miso dip. I think you were reading my mind. I was on Pinterest looking for ideas for unique crudite platters to serve for the holidays. Love the idea of the colorful radishes! I was thinking the same thing! I can’t wait to try the dip! It sounds perfect. Thanks Emilie and Happy Thanksgiving! Just pinned this to my Thanksgiving board as the perfect afternoon lunch/snack before the big meal. Those watermelon radishes are beautiful! I’m going to have to look for them. I love the sound of this miso dip!! I can just imagine how good it tastes with all of those vegetables. I’ll definitely be making this. As for those watermelon radishes, I’m so jealous you have access to those. I’ve only seen them once here in Brisbane. I might have to get some seeds and grow them I think. They are just so pretty!! Hi Jennifer! The watermelon radishes are intriguing, aren’t they? They only pop up here in NY this time of year- late fall- early winter. They’re awesome. I do hope you can find some in Brisbane again. But if you grow them yourself, let me know! I’d love to try that as well. You totally channeled all of my usual feelings about these platters at parties – and have seriously won me over with your version here (that sauce!). I hope you and your family have a wonderful Thanksgiving this week Emilie! I know there is bound to be heaps of delicious food <3 hugs! Right? I can’t stand those platters. It’s the crackly carrots that get me every time. veggies don’t have to be boring! I don’t eat crudite platters for all the reasons you listed. 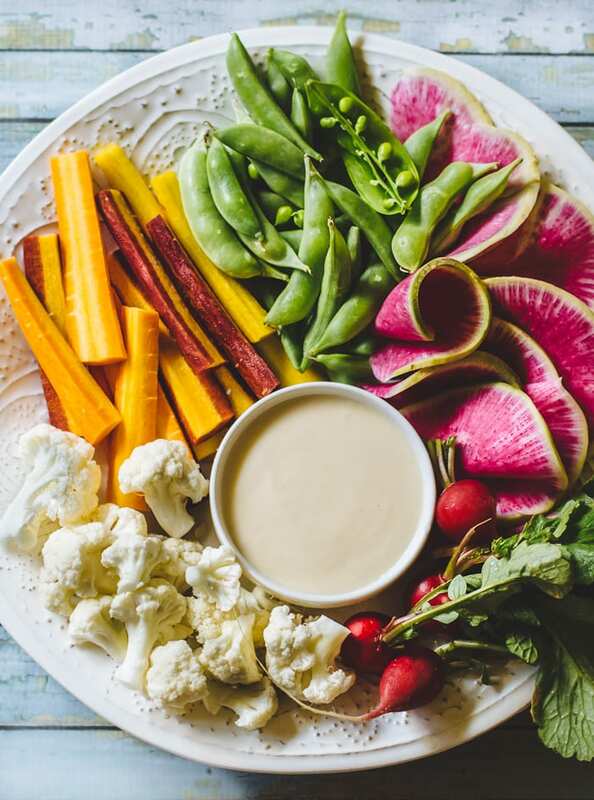 Now, this crudite platter I could definitely get behind. It looks fantastic, and I bet that miso dip would taste good on cardboard. PS- I’ve had your butter chicken on my mind lately… I think I’m going to try that soon. Has anyone actually tried the dip? The vegetables are beautiful!